Cold mountain air calls for warm drinks to share. The Camp Chef Java 5 Coffee Set has everything you need to keep warm at the campsite and the tailgate. Brew up to eight cups of your favorite toasty beverage at a time. 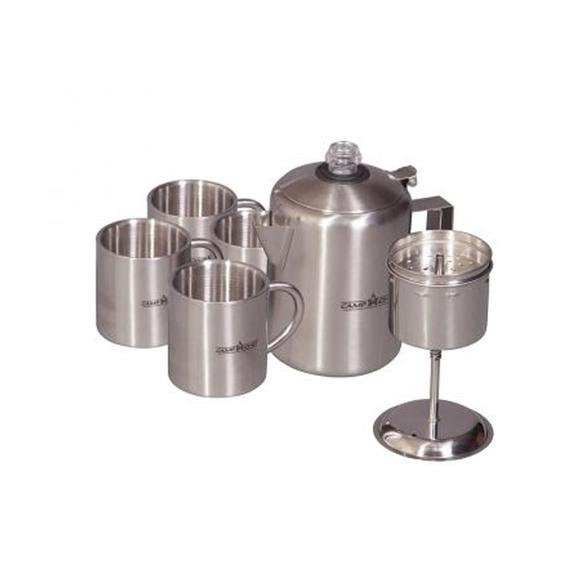 Includes four insulated stainless steel mugs. Other features include hinged lid, easy-pour spout, large handle and a shatter-resistant percolator view. Dimensions (packed) Box: 12" x 11" x 10"
Maintains the coffee hot, easy to use. Highly recommend!